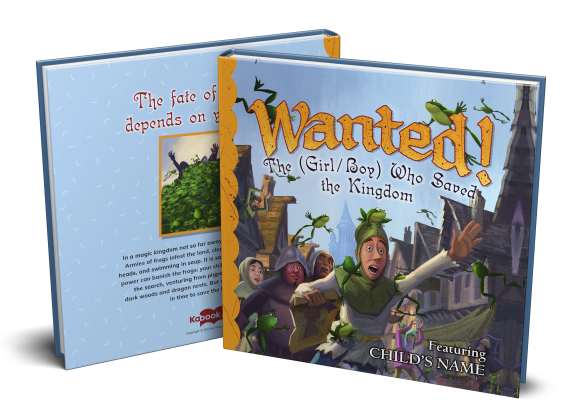 Wanted | Custom Children's Book | Kabook! The fate of the land depends on your child! In a magic kingdom not too far away, armies of frogs are invading and only (gulp!) one child can possibly help! This mind-blowing story only requires one photo (you can take a new one or upload one from your library) that search parties will use to scour the kingdom for the chosen child. You will also need to provide details (such as favorite food, favorite song, etc) that will be incorporated into the story to make sure the one true child is identified! Minimum effort for this one. Maximum reward! Answer the following questions and upload one photo to find out! *Please enter the capitalization of the text exactly as you would like it to appear in the story. Have you fed the boy/girl they call [Child's name]? She/He has been known to eat [Child's favorite food]. Use lowercase for generic games ("soccer") but capitalize any branded games ("Monopoly"). Don’t have all the answers? Email your hero’s inner circle to gather the intel and build the perfect gift. Kabook! uses sophisticated artificial intelligence and neural network processing to make your photo look like the illustration style of the book. Add a close-up photo of your child in the style of an old-fashioned Wanted poster. For best results, your child should be looking directly at the camera. Feel free to try different expressions -- serious, smiling, or silly!